On the weekend of September 22-24, 2017, hundreds of Seventh-day Adventist adults and young adults converged on the Little York Spanish SDA Church in Houston, Texas. Initially it was planned as a Master Guide camping, but was transformed into a relief effort in the aftermath of Hurricane Harvey. Texas Conference Youth Director Paulo Tenorio led the effort. I was privileged to be a part of this humanitarian effort of the Texas Adventist youth, especially as the Houston Bay Area was ravaged with unbelievable floods that covered highways and whole neighborhoods. Accompanying me were Chris and Hannah Chung, Eddie Suvanaratosot and Steven Trujillo, volunteers from our church with the desire to make a difference. The author, along with Chris and Hannah Chung (L to R) traveling from Fort Worth to Houston, Texas. We arrived too late for the evening Vespers message given by Pastor Helvis Moody, but we were blessed the next morning by a rousing message and appeal given by Pastor Gary Blanchard, Youth Director for the General Conference. His appeal was for Seventh-day Adventists to take action upon their beliefs and faith, spreading the message of God not just by verbal report, but also by genuine activities of concern. SDA World Youth Leader Pastor Gray Blanchard issues a clarion call for Adventist Youth to attend to the physical and spiritual needs of others. It was a fitting message to start the day. In the afternoon our group decided to knock on doors with GLOW tracts discussing natural disasters and tragedies and where God’s love is in all this. As we drove by the affected neighborhoods, the effects of Harvey became very apparent. Mountains of trash, wood, ruined furniture and damp sheetrock were piled in front of home after home. It was almost a whole month since the flood, and the trash looked like it would take weeks to haul off. The neighborhoods had piles of flood damaged goods and building material. The Texas Youth Director made sure we were armed with these guys before heading out to the community. We prayed with several residents and asked them if they needed assistance with anything. 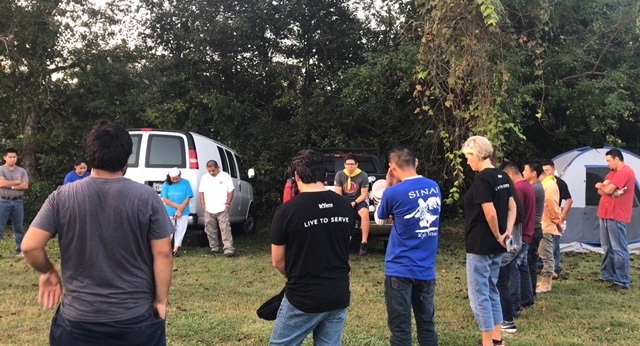 Some of the respondents were suffering great financial loss; during the gathering back at the church reports from our volunteers surfaced of meeting residents that lost everything. Some had family that were also being affected by the hurricanes Irma, Jose and Maria. Volunteers Chris Chung and Eddie Suvanaratosot talk to and pray with an affected resident. On Sunday morning we were assigned to help the Oaks Adventist Christian Academy in Cypress, which is northwest of the Houston area. The damage to the school was extensive. The walls had to be torn down; at places more than half the wall had to be removed. The restrooms and many other facilities needed removal. For the time being, classes were held in the gymnasium while repairs were being done. We were saddened to think of how the students’ learning would have been interrupted, and were glad we were there to lend a hand. Finally, after we had moved quite a bit of furniture and appliances, the gymnasium looked good to go. Partitions had been erected as makeshift classrooms. We prayed that the Lord would again impart His blessing on the faculty and students of this beleaguered school. A devotional and prayer by Pastor Tenorio before Sunday morning community relief effort. Chris Chung sweeping school grounds. Whole sections of the school wall had to be removed to prevent mold from growing after the flood waters subsided. Volunteer Steven Trujillo making a difference. In small but tangible ways, each individual volunteer helped local residents and the local church school get back to business again. If you look closely, half way up the windows you can see a line where the water level was at its height. During and right after the storm, first responders had to access the area by boat. A week later the Master Guides returned, although we were not able to participate again. Almost 400 volunteers went at it again, repairing walls, helping local residents in small but meaningful ways to get back on their feet. Temporary partitions were erected in the Oaks' gymnasium to allow classes to resume. The volunteers helped move heavy items, swept and mopped floors to allow students to resume their Christian education in makeshift classrooms like this one, complete with appropriate "Welcome Back" poster. As Christians we have a solemn duty to attend to the needs of others. Our Savior Himself set a perfect example, dining with those in spiritual want, healing the sick and appealing to those that lived in opulence to give up their material abundance to assist the needy. True Christians are never blind to the call of those in need. Obviously one doesn't wish to encourage fraud by giving to those that don't need help, but the greater issue at stake—beyondmaterial or monetary giving—is the character of the Christian. Find where the genuine need of a person lies. Perhaps they need less of your money than of your time and effort. You never know. Perhaps a person you prayed with and handed that GLOW tract to would come to know the Lord. Maybe a lady you helped take out trash from her flood-torn home will come to appreciate and know the Jesus she saw in you. Historically, Adventists have been experts in Bible eschatology, expounding on prophetic fact after prophetic fact. This is an important and non-negotiable part of our faith, of course; Jesus told His disciples to rejoice when they see these signs, because they mean the end of sin and suffering is drawing near (Luke 21:28). But there comes a point when even the signs of the times can fail to convince others. However, the Christ within us can. The signs of the end have been going on for almost two centuries. Christ isn’t waiting for a particular sign to appear before He can come. Christ is waiting for His people to reflect Him perfectly—not just in word, but in action (II Peter 3:10-14; I John 3:2-3). Too often we have the “theory” of how to be saved, or even how to hasten God’s kingdom; we’ve settled into respective theological circles that teach a particular version of the Gospel. Of course we do need to know what God’s Word would have us believe, and so getting the theology correct is important. But it is only one piece of the puzzle. The actions of professed believers belie their true allegiances. Let’s make a difference today! To help contribute monetarily to disaster relief, support ADRA’s efforts here.